Posted by flashlightblog in Food, Maddi's Fridge, Play. I have Google and Twitter alerts set to tell me when webpages or internet users are discussing Maddi’s Fridge. 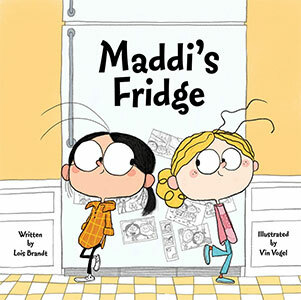 Sometimes I get great surprises, like when the Seattle School District teachers were striking and, to pass the time, read Maddi’s Fridge out loud on the picket line. I ended up visiting some of those teachers at Queen Anne Elementary, an inspiring Seattle school. I also got an alert when a dad complained on twitter that his daughter asked him to read Maddi’s Fridge every night and it was “so depressing.” I tweeted to the dad that Maddi’s Fridge was like that. Parents get all teary-eyed and kids get empowered. Last week an alert notified me that Childsplay in Tempe, Arizona, was going to put on a production of Maddi’s Fridge during their 2017 – 2018 season. Look at the company Maddi’s Fridge is keeping! When I checked in with Flashlight Press, they told me that they had just finalized the rights agreement. Double wow! I am so grateful to Childsplay for discovering Maddi’s Fridge and turning it into a play. Years ago when I opened my best friend, Liz’s, refrigerator I felt that the entire world had failed me. What kind of world do we live in where my best friend and her little brother didn’t have enough to eat? But now, the people at Childsplay have found the story that my eleven-year-old self wanted to SHOUT OUT TO THE WORLD. Here, in one of the richest countries in the world, our friends and our neighbors are struggling to feed their children. A big THANK YOU to everyone at Childsplay. I am so excited that you are sharing the story of Maddi’s Fridge. Posted by flashlightblog in Author Notes, Author Signings, Book Launchings, Dragon.